[Q] You know, something that occurs to me, telling us about this first big job doing... and telling us what you had to do... I mean, this seems to me like a huge responsibility you had. Yes, it was a huge responsibility. [Q] I mean, a lot of money to spend on it, obviously, and your decisions, and so on, but a huge responsibility. Can you say a bit about what it felt like to have that sort of responsibility at that early age? Weren't you scared, or what? No, I wasn't scared, no. And remember there was one person above me who was the production designer, art director, Tom Morahan, but he didn't spend much time in Villefranche because he had to build the set at Denham, you know. But he was my biggest problem, because Tom used to drink a lot, and then became very... nasty. And I'll never forget one thing, you know. You know the masts are in three bits: you've got the mainmast, and then the topmast, and then the topgallant mast, and you have a platform where, you know, the people... go out and, you know… well, I... that didn't appeal to me because funnily enough, even though I was a pilot, I didn't like to be attached to the ground on... at any height, you know – I didn't like that. And Tom Morahan came down, and he was a bit of a sadist, and he said, 'Have you checked the platform' – I can't remember the name, what it is now – 'of the mainmast?' I said, 'Yes'. He said, 'Well, would you mind going up and checking it for me?' I said, 'Tom, you're not going to get me to go up! I checked the thing before it was pulled up'. And so he said, 'You're afraid?' I said, 'Yes, I am afraid'. He said, 'Okay, I'll go up'. And he was drunk, you see, and... he was Irish, you know. And everybody in the shipyard hoped he would fall off, you see. But Jack Warner heard about it, and because Morahan was a fabulous designer, really, but he was, you know, drank too much, and so on. And Warner said, you know, we heard the thing happen - if it happens again, you're off the picture. So, all that was really left to me. But also Morahan was left to me, because I used to take him to Marseilles, because we had to get material from there, and so on. And he got involved with someone – in those days there were a lot of gangsters and so on... and I always... got into fights, and I always had to get him out of it and so on, you know – unbelievable times! Sir Kenneth Adam (1921-2016), OBE, born Klaus Hugo Adam, was a production designer famous for his set designs for the James Bond films of the 1960s and 1970s. Initially, he trained as an architect in London, but in October 1943, he became one of only two German-born fighter pilots to fly with the RAF in wartime. He joined 609 Squadron where he flew the Hawker Typhoon fighter bomber. After the war, he entered the film industry, initially as a draughtsman on This Was a Woman. His portfolio of work includes Barry Lyndon and The Madness of King George; he won an Oscar for both films. Having a close relationship with Stanley Kubrick, he also designed the set for the iconic war room in Dr Strangelove. 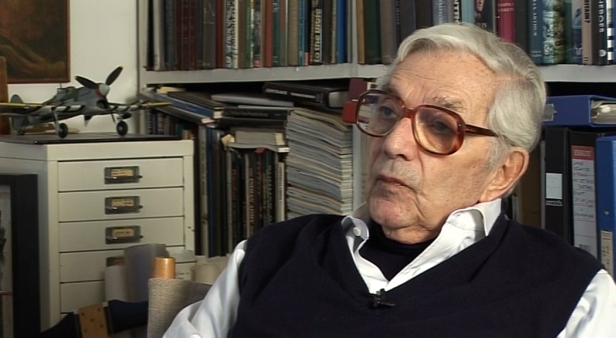 Sir Ken Adam was knighted by Queen Elizabeth II in 2003.